I can't believe we are already in the month of December. Where did the time go? Christmas is just around the corner and I still don't know exactly what I want, but I have a pretty delicious treat for one of our lucky US Readers! Yes, you finally get a giveaway all to yourselves and it's absolutely delicious. Chocolate covered strawberries. Who doesn't love 'em? 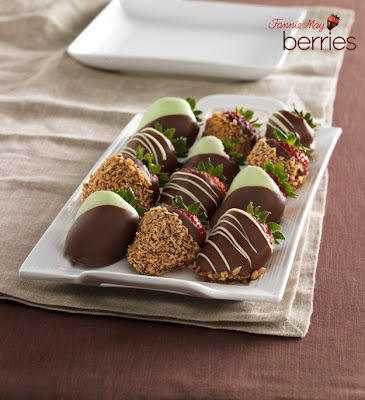 Chocolate covered strawberries are one of my favorites. Chocolate is a must, but then you have the strawberries. Together they make the perfect treat. If I could have a box of them with a glass of wine and watch Bridesmaids, I'd be set for the night! Just thinking out loud now, this would be a perfect Christmas gift, for myself (let's hope the hubby is reading this, lol) or a great gift idea for anyone you may know. Fannie May has been in business for over 90 years producing amazing quality chocolates to their customers and also have their amazing delicious Chocolate covered berries. Fannie May Berries includes hand crafted indulgent flavor combinations including Sea Salt Milk Chocolate Caramel, Pink & White Champagne, Toasted Coconut & White Chocolate, Milk Chocolate Caramel & Nuts and Holiday flavors—Dark Chocolate Gingerbread, Candy Cane and Eggnog. I don't know about you, but those Holiday flavors sound awesome and something I'd definitely love to try! Fannie May Berries can be ordered online directly from your home and shipped as soon as the following day, perfect way to send a gift this Holiday Season. You can check out more information about Fannie May Berries on their Twitter and Facebook and connect with them so that you'll be the first to know about deals and new products they come out with!